"This is a recipe I just throw together, but it is very popular. Serve with tortilla chips." In a medium-size mixing bowl, combine tomatoes, onion, cilantro, garlic, lime juice, tomatillo, and salt to taste. Mix well. Add 1/2 of the jalapeno pepper, and taste. 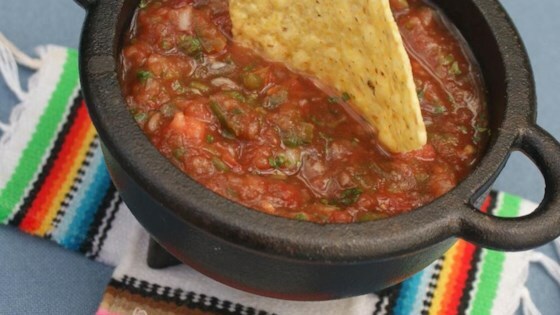 If you desire your salsa with more of a kick, add the remaining 1/2 jalapeno. If you are satisfied with the salsa's heat, do not add the remaining jalapeno pepper. Cover the salsa, and chill until ready to serve. This salsa lacked something - I served when guests came over and everyone agreed it just wasn't very good. I ended up throwing it away. This salsa is mostly onion, and very strongly so. The cilantro is very strong, too. It would be better if these two ingredients were reduced by about half, and maybe more tomatoes used. This is the recipe I was searching for! It turned out great. I ended up using the entire pepper as I thought the heat needed to be turned up.